The U.S.News & World Report magazine publishes an annual report comparing the best colleges and universities of America. 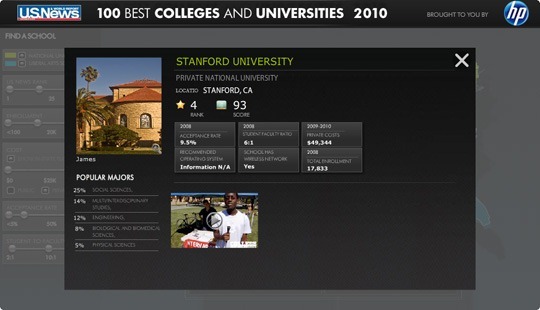 Using the latest college ranking data from the US New magazine, HP has created an interesting AIR App that will help students research colleges in the US visually. 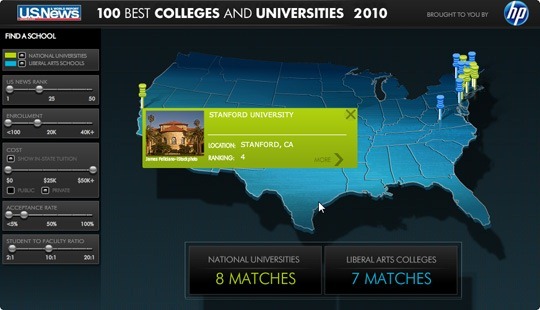 The yellow pins represent national universities while blue are for liberal arts schools. You can use the sliders in the sidebar to shortlist colleges based on the student to faculty ratio, cost of education, etc. For detailed information about a particular college like the overall student strength or to know about subjects that are popular in that college, just click the pin. Should College Students Cite Wikipedia in their Academic Papers?